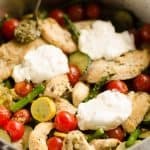 Summer Pesto Chicken & Vegetable Skillet with Burrata is a light and healthy 20 minute dinner recipe full of fresh flavors. Add the chicken tenders to the hot skillet and season with 1/4 tsp salt. Add the red onions around the chicken. Cook for 5 minutes. Turn the chicken and toss the onions. Add the asparagus to the skillet and cook for an additional 3 minutes. Add the zucchini and yellow squash. Sprinkle everything with the remaining salt. Cover and cook for an additional 2 minutes. Toss everything with the pesto, stirring until everything is coated and add the cherry tomatoes. Cook one additional minute just to heat the tomatoes a little. Tear apart the burrata into large chunks and top the skillet with the cheese.